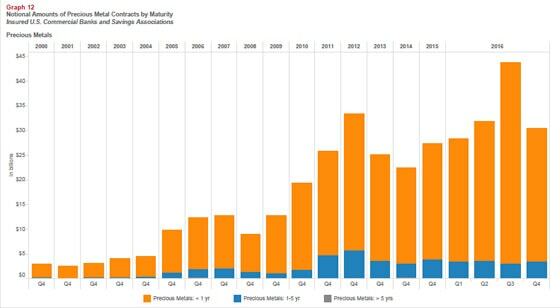 According to the most recent report on the U.S. Financial Institutions Derivatives trading activity, the U.S. banks held a record amount of precious metals contracts in the first quarter of 2017. Not only did the U.S. banks report a record amount of precious metals contracts, but they also held an unprecedented quantity in notional value of commodity and equity derivative contracts. There just seems to be a lot of paper floating around in our highly inflated stock, bond, and Forex markets. And… there needs to be. Without an ever increasing amount of leverage via their derivative bets and hedging, these markets would be in serious trouble. Furthermore, the practice of using contracts to hedge bets upon on other derivative bets has put the financial market in a highly fragile state. As we can see in the chart, the overall trend has continued higher since 2000. What is interesting is that the notional value of precious metals contracts held by the U.S. banks was even greater in the first quarter of 2017 versus Q4 2012 when the prices of the precious metals were much higher. In looking at previous data, some quarters reported a larger amount of precious metals contracts, which was due to the banks adding short contracts as the price of precious metals increased. However, Q1 2017 of $43.6 billion was up considerably versus the $28.3 billion in Q1 2016. Forward Exchange Contract: A forward exchange contract is a special type of foreign currency transaction. Forward contracts are agreements between two parties. Forward contracts are not traded on exchanges, and standard amounts of currency are not traded in these agreements. They cannot be canceled except by the mutual agreement of both parties involved. The parties involved in the contract are generally interested in hedging a foreign exchange position or taking a speculative position. The nature of forward exchange contracts protects both parties from unexpected or adverse movements in the currencies’ future spot rates. We don’t know the percentage breakdown of the Gold or FX contracts. However, I would imagine the majority being in the FX Contracts that are hedging the different fiat currencies. 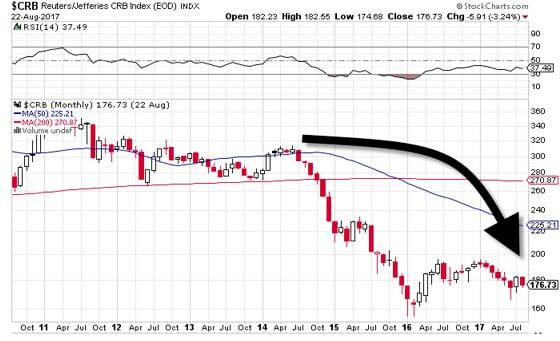 What we have here is a great deal more FX & Gold paper amounts trading versus the global GDP. In 2013, the FX & Gold notional amount by the U.S. banks accounted for only 28% of global GDP. However it jumped to 41% in 2016. I would imagine in 2017, and it will be even higher. 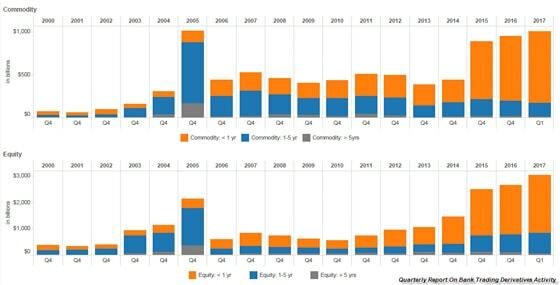 These two charts display the amount of “Commodity” and “Equity” contracts in notional dollar figures held by U.S. banks. While there was a temporary blip in 2005 (mostly longer dated contracts – in BLUE), there was a pronounced increase in 2015, 2016, and 2017 in both of these derivative asset classes. According to the data by the OCC, the U.S. banks held $1 trillion in commodity contracts and $3 trillion in equity contracts in the first quarter of 2017. While these figures are much less than the FX & Gold contracts, they have still increased substantially over the past three years. For example, in 2014, the U.S. banks held $431 billion in commodity contracts and $745 billion in equity contracts. 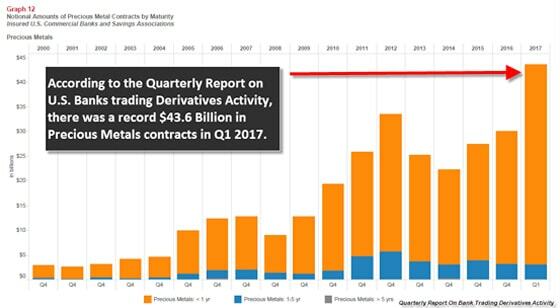 In just three years, the U.S. banks exposure to commodity contracts has more than doubled to $1 trillion, and their notional amount of equity derivatives has quadrupled to over $3 trillion. Again…. the U.S. banks are holding onto a record amount of paper derivative contracts in these different asset classes. Yes, it makes some sense that the U.S. banks’ total notional equity value is increasing right along with the rising highly-inflated stock market, but seeing the commodity exposure double when the prices of most commodities are much lower than what they were before 2014, is intriguing. As the commodity index above fell from over 300 in 2014 to 176 currently, the amount of U.S. banks, exposure to the commodity market has more than doubled to $1 trillion. Unfortunately, I don’t know all the particulars as to why the U.S. banks have increased their exposure to such a great extent in these different asset classes. 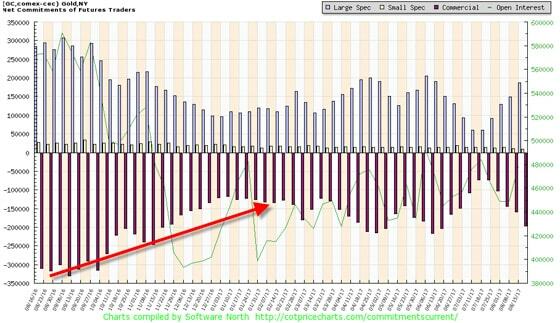 However, to see a record amount of paper trading in a market that is already highly leveraged points to big trouble ahead.